Hello - relative rookie here. Even though the weather was cold last night, it was the very first clear night of 2017 in southwest Ohio, so I figured I'd give it a go. I wanted to try imaging the Horsehead Nebula, using my Celestron C6 CST, with my D5100 and the Celestron 0.63 focal reducer. Unfortunately, I noticed some strange arcs of light in my images (even showed up in the camera viewfinder), and I'm not sure what the cause is. I've seen this before and never figured out the cause, although I suspect the focal reducer. It seems to be caused by very bright objects. 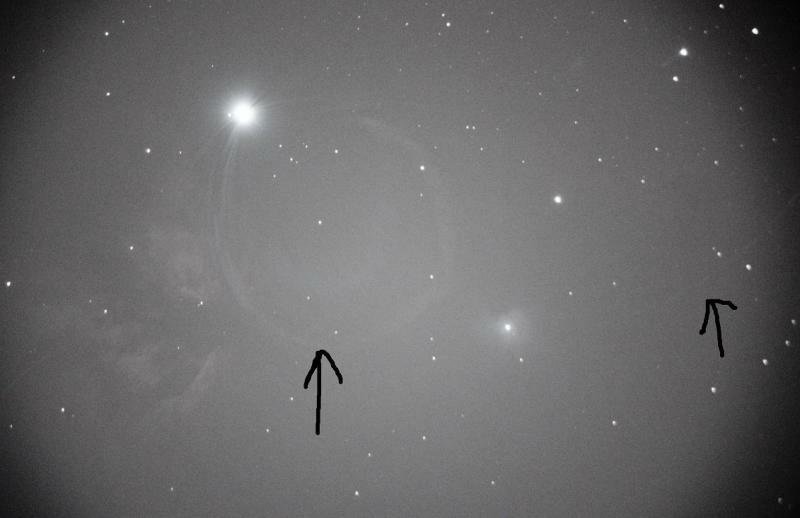 The attached image shows an arc coming from Alnitak, and another faint arc coming from an object off screen to the right. Does anyone have experience with this type of aberration? My guess is the focal reducer, but it was too **** cold outside to mess with it last night, so I gave up. It is possible a spot on the optics, you can check it out with a flash light in a dark room. Lens flare. What spacing did you use? I've found that 105mm from the camera sensor to the rear of the R/C works the best. Also try recomposing when really bright stars are involved. I have the camera very close to the focal reducer, less than an inch from the face of the camera. So if I assume 55mm from the sensor to the face, then another ~20mm or so to the reducer, that's about 75mm total. I have a longer adapter I can try, but it will put the distance well over 105mm. ...and the Celestron 0.63 focal reducer. This is a common problem with the 0.63x reducer. Unfortunately, I have not seen a solution. UPDATE: After further research and some testing of my own, I have discovered what the real problem is. It's NOT the focal reducer (although it makes it worse), it's internal reflections along the inside of the baffle tube that runs up the center of the C6 from the rear. I tested this theory by taking a photo of a simulated bright star, then lining the inside of the baffle with some black felt fabric found at the local craft shop. The results were remarkable, as you can see in the photo comparison below. The right hand image is with no felt in the baffle, while the right hand image is with the felt in place. Note that both images were taken with the focal reducer installed. It turns out that while the inside surface of the baffle is ridged, it's painted gray, not black, and fairly reflective to incident light of shallow angle. An inexpensive sheet of felt paper solves the problem, although I haven't confirmed that it doesn't cause another problem!